The P-9801 is a true eight-channel radiometer/photometer designed with eight photocurrent-to-voltage amplifiers (no multiplexing) and eight 12 bit highly linear analogue-to-digital converters (ADC) enabling signal sampling of all channels simultaneously. Each channel's wide 0.1 pA to 2 mA signal range covers the dynamic range of most current semiconductor photodiodes for nearly unrestricted use in any light measurement application. The difference between the three P-9801 versions is their analogue amplifier. P-9801-V01 is set-up with a gain dependent slew rate of 2 to 10 ms for universal light measurement purposes. P-9801-V02 amplifier offers a gain range independent rise time for the pulse energy measurement of short light flashes using a pulse stretching method. P-9801-V03 offers a fast rise time of 1ms (range 6 and 7 10 ms) for high speed data logger applications with external trigger and pre-trigger function. The fast sampling rate of the P-9801 ADC enables an adjustable integration time of 1ms up to 999 seconds formed by the average of multiple measurements with 100us integration time. This averaging feature support fast data logger measurements used in peak-to-peak, short pulse energy measurements and other modes. The maximum error within this wide dynamic range is 0.2 % through traceable calibrations of each range. Pulse energy measurement mode where the energy of the light flash is integrated. Measurement values are displayed in (lxs) lux-seconds, xy chromaticity values and color temperature. Integration is done by a pulse stretching method enabling the measurement of light flashes with pulse lengths shorter than the meter rise time. Pulse shape is measured with high speed data logger. Pulse length, peak intensity, integral of the pulse energy and color values are calculated using the logged data. The P-9801 offers unique features for short event measurement like an internal trigger selectable for the measurement signal of channels 1 to 8 or external trigger. The pre-trigger function enables the measurement of the signal before the triggered event. Here the sampling rate of the data logger measurement is limited by the rise time of the optometer. A bi-directional RS232 serial and IEEE488 interface allows external remote control. For integration of the P-9801 in applications in strong ambient electromagnetic environments, e.g. high power arc lamp measurement, the P-9801s offer a high quality metal housing for best EMV shielding and rack mount option. 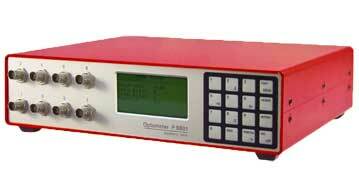 Download the P-9801 Channel Radiometer/Photometer Technical Data Sheet pdf file.